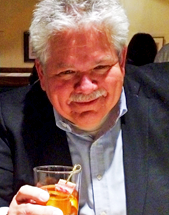 Rick Sebak has produced and narrated some tasty programs for public television. His 1993 documentary titled “Pennsylvania Diners & Other Roadside Restaurants” introduced Rick’s friendly style to his home state and to viewers across the country on PBS. He has since made a number of programs about often overlooked aspects of American culture and cuisine. His 1999 “A Hot Dog Program” has become a perennial summertime favorite, as have other food-friendly specials like “An Ice Cream Show”(1996), “Sandwiches That You Will Like” (2002) and “To Market To Market To Buy A Fat Pig” (2007). In 2010 and 2012, Rick and his early-rising team also produced “Breakfast Special” and “Breakfast Special 2: Revenge Of The Omelets.” When he’s not concentrating on edible topics, Rick has also put together programs like “A Ride Along The Lincoln Highway” (2008), “A Cemetery Special” (2005), “A Program About Unusual Buildings” (2004) and “Great Old Amusement Parks” (1999). He has also made more than 30 documentaries about his hometown, a popular set of specials known collectively as The Pittsburgh History Series. His programs “A Few Good Pie Places” and “A Few Great Bakeries” premiere in the late summer of 2015.